But little did they know, the Galinato Book did more than bring the family – that has since become global – together (again). The Galinato Book, whose slideshow version was posted online, solved a 50-year old family mystery. While this story could hardly be alluded to the 1962 psychological thriller, the question asked of Bette Davis’ character was a constant topic during the countless Galinato family gatherings. Elizabeth’s sister, Amor Socorro L. Bogwill, relates how their elders used to always tell the story of their missing sister, Baby Jane. Baby Jane, born Mary Jean B. Galinato, the 5th of eight children of Gallarza A. Galinato and Emiliana Bernados, was apparently borrowed from the family by the father’s Manila-based twin brother “Lory” whose second relationship was childless. 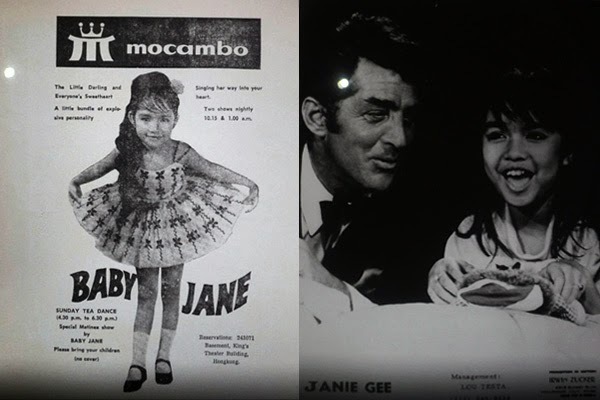 The little girl Jane was a talented singer and an adorable performer and was given the showbiz name Baby Jane. From then on, the Bernados-Galinato family never heard of Baby Jane anymore. They knew that she was brought the U.S.A. by the uncle Lory and their attempts at finding her and getting her back, with relatives in the U.S. helping in the search, never succeeded. Jane would become the family’s lost daughter and sister, whose photo in the Galinato Book, remained that of a child (the last photograph the family had of Baby Jane). 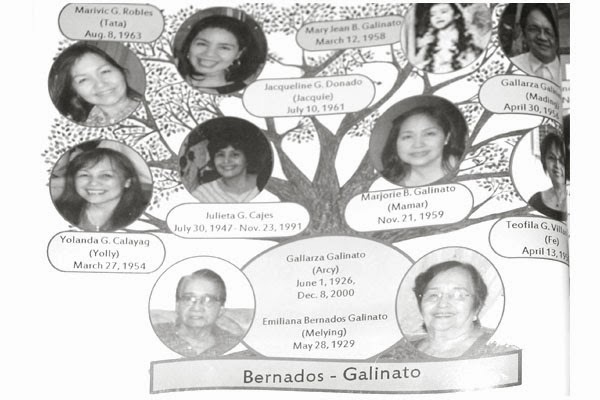 The Bernados-Galinato family tree missing a photo of Mary Jean "Baby Jane" Galinato as an adult. One can never really get over a missing daughter, sister, niece, cousin. The Galinatos and their extended families and friends all helped in seeking for the lost Galinato child. A Galinato uncle would recount how, during his U.S. visit in the late 80s, he posted missing posters on a Texas community church’s bulletin board in the hopes of helping spread the word around the Filipino community. There will be several stories of searching such as these. The Galinatos’ search for Baby Jane spanned from the time of telegrams to the advent of the internet and, at last, Google and Facebook. The sisters would keep doing name searches for Mary Jean B. Galinato, Jane Galinato, etc. We know we’ve experienced doing this on Google and Facebook, searching for lost classmates, childhood crushes, relatives, exes. Incidentally, almost a year ago, a curious young lady in the U.S.A. bumped into a family book online, the family name and origin matched her mother’s. And it was. But the delight of discovering and possibly connecting with family back in the homeland was not the real shocker. 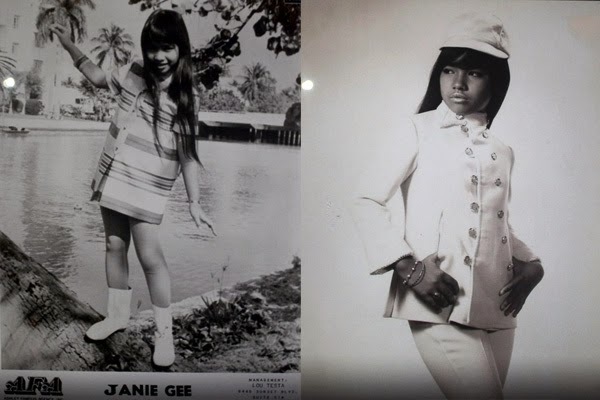 The mother of Alisha, Jane Zenaida Galinato Smith, in her childhood showbiz days was formerly Baby Jane, who then became the singing girl wonder Janie Gee in her pre-teen years, but stopped singing professionally before her teen years, ONLY daughter of Lori and Soni Galinato, now mother to three adult children Alisha, Sonia and Nathaniel – was met with a stirring news – she is not what she’s told she was. After Alisha’s discovery, and with the real names of family members listed on the Galinato Book, proper Facebook name searches were made, Facebook personal messages and introductions sent, there you have – an epic Facebook reunion Mark Zuckerberg should be proud of. The Baby Jane, now found, and in this story, shall now be referred to as Jane Galinato, confirms her daughter’s post in the comments section (after queries of worried friends suggesting DNA tests, etc.). Jane’s other daughter, Sonia, also joined in connecting online with the new-found family. She posted a Facebook album of some her mother’s pictures from her younger showbiz days. Indeed, the father’s plea was heard, but no longer for himself and Jane’s birth mother to enjoy. They have laid their hopes for the bittersweet reunion to be experienced by their children. Very soon after the virtual family reunion, it was set. Jane must come home to the Galinato. The 2nd Global Galinato Grand Gathering, which was supposedly scheduled in 2012, has been moved prior to the finding of Jane, to July 26-28, 2013. 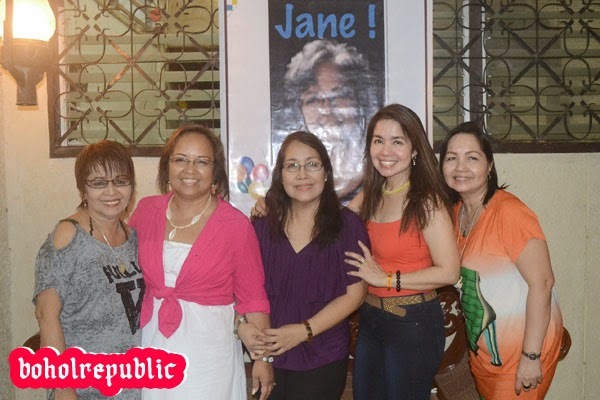 Jane must come to the Philippines and attend. Months later, plenty of online exchanges later, many a Facebook family introductions after, and after perhaps enough time for the deluge of emotions to equalize, Jane Galinato, after 51-years, has finally come home. With Jane (and her family) back in the Galinatos’ arms, and with the new-born Galinatos that came in the last three-four year, a new version of the Galinato Book should be in the works – a page or more added – continuing its promise of “bonding and oneness” that will live on for years to come. 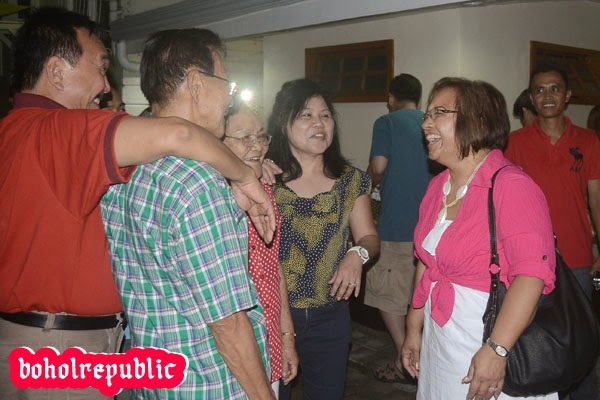 At the June 26 dinner hosted by the Lamdagan-Galinatos family, Jane Galinato met, for the first time, many more of her family, uncles, cousins, nieces, nephews. Some, she has already connected with on Facebook. The others, she’s met for the first time. All smiles at the Global Galinato Grand Gathering where Baby Jane meet long-lost relatives. But one Tagbilaran-based relative, there for the GGGG, who may have been out of the Facebook loop, only knew of the “Baby-Jane-homecoming” that night. Who is she? Oh, she’s THE “Baby Jane” Mama used to tell us about? She then meekly extended her arms to embrace the long-lost relative. 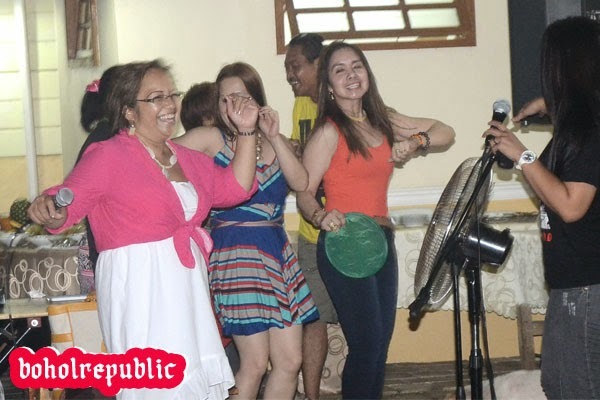 The “whatever-happened-to-Baby-Jane” stories continue to be a staple in the Galinato family gatherings. But this time, they’ll have answers. Baby Jane was borrowed, and has been returned. Jane Galinato has come home.